One of the most exciting parts of winter for children is snow. It often means a day off from school and gives them a chance to enjoy snowball fights, making snowmen, sled riding and other winter activities. But all this winter fun can sometimes be overshadowed by potential health risks that come along with cold weather, snow and ice. Before you send your children outside for some snow day fun, it’s important to make sure they’re fully prepared for the cold. You also need to be aware of the safety risks involved with winter weather and how you can protect your child from them. Making sure your child is dressed appropriately for the weather is one of the most important ways to keep them safe from the cold. Not wearing enough protective clothing can lead to frostbite and other cold weather related issues. The best way to keep your child warm while they play outdoors is to dress them in layers. Items you may want to consider using include long underwear, long sleeved shirts, sweatshirts and multiple or very thick socks. In addition to these layers, you should be sure your child is wearing snowpants, a heavy winter jacket, a hat, mittens or gloves and a scarf. It’s also very important to make sure all layers of clothing your child wears to play in the snow are water resistant. If your child sweats while they play, cotton clothing can quickly become saturated and cause children to become colder faster. 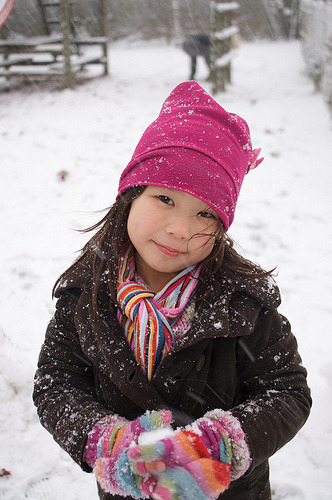 Snow could also easily make your child’s coat, gloves, hat or shoes cold and wet if they are not water resistant. No matter what age your children are, it’s important that you supervise their outdoor play to some degree. Young children in particular should be supervised very closely. This means that you should also bundle up and head outside with them. Older children may not need the same kind of constant supervision, but you should peek out at them often if they are playing right outside the home. You never know when accidents could happen. Even if your children decide to play further away from your house, it is still a good idea to check in occasionally. You may even want to consider giving them a cell phone to contact you in the event that an accident would happen. Because playing in the snow is so much fun for children, it’s easy to understand how they could lose track of time. However, hours of play combined with extreme cold can result in injuries and exhaustion. In order to prevent this, you should bring children inside occasionally for breaks. This time will allow children to rehydrate or eat, change into dry clothes, get warm and re-energize before going outside again. Even if your child is taking breaks often, sometimes the cold can still get to be too much. Always look for signs such as shivering or chattering teeth. These are the first signs of extreme cold. If a person continues to stay outside once these signs start, frostbite or even hypothermia could occur. If your child is older and you are not outside with them, be sure they know that these signs from their body mean it is time to come inside and get warm. Having fun in the snow during winter is something every child should be able to enjoy safely. We hope these tips allow you and your child to feel more at ease about how to handle the snow and cold. If an accident does occur, or you suspect your child is suffering from frostbite or hypothermia, be sure to call 911 or visit the emergency room immediately. If you have any other questions about outdoor winter safety, feel free to call our offices at412-231-2957.